CURT manufactures over 1,000 different trailer hitches to meet every possible towing need. It is our goal to always be your best option for towing by providing a complete line of quality products and being first-to-market with towing products for each new vehicle. If we can get you out on the road with a hitch you can enjoy for years to come, doing more of what you love, we have done our job. With tested and validated designs, we employ state-of-the-art equipment and a skilled workforce, right here in the USA, to produce tow hitches that set the standard for our industry. Once built, our hitches are sent through multiple stages of cleaning, including a shot blast and a wash and preparation system. Then, each hitch is dipped in a liquid Bonderite® coating and finished in our high-gloss or carbide powder coat. The co-curing of the Bonderite® and powder coating provides superior rust, chip and UV protection. Trailer hitches (also called tow hitches and receiver hitches) come in all sorts of shapes and sizes. While there are many special types of hitches used for towing (such as 5th wheel, gooseneck and pintle hitches), standard trailer hitches can generally be categorized into one of five weight classes, with a few exceptions. In the section below, we have provided information to help you understand the different classes of standard trailer hitches and the weight ratings and vehicle types associated with each. Class 1 and 2 trailer hitches are light-duty receivers generally found on small to mid-size passenger cars and smaller crossovers and SUVs. They can typically haul motorcycles, personal watercraft and other small trailer loads. Class 1 hitches have a 1 1/4 IN receiver tube and a maximum gross trailer weight (GTW) rating of 2,000 lbs. 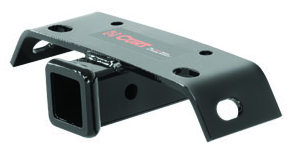 Class 2 hitches also have a 1 1/4 IN receiver tube but feature a GTW rating of 3,500 lbs. Class 3 hitches are the most common trailer hitches found on vehicles today. They have applications on everything from full size sedans to full size pickup trucks. They are perfect for handling a boat or pop-up camper for a weekend getaway or simply hauling a utility trailer to the city dump. Class 3 trailer hitches have a 2 IN receiver tube and a maximum gross trailer weight rating of 8,000 lbs. Class 4 hitches are the go-to hitch for those towing larger trailer loads such as heavy construction equipment, campers and boats. Similar to class 3, class 4 hitches are designed for larger vehicles such as full size pickups and SUVs. Class 4 trailer hitches have a 2 IN receiver tube and a maximum gross trailer weight rating of 12,000 lbs. When a 6-ton gross trailer weight rating is not enough for your full size pickup, CURT offers the class 5 trailer hitch line. The class 5 hitch line is broken into two subcategories: the Xtra Duty series and the Commercial Duty series. Xtra Duty hitches have a 2 IN receiver tube with a maximum gross trailer weight of 17,000 lbs. Our Commercial Duty hitches have a 2 1/2 IN receiver tube and a maximum gross trailer weight of a whopping 20,000 lbs. These hitches are strong enough to handle many of the largest non-5th wheel and non-gooseneck trailers out there. All CURT class 5 trailer hitches come with a rugged carbide finish for scratch and fade resistance. For certain applications, having a trailer hitch receiver at the front of your vehicle may be necessary. 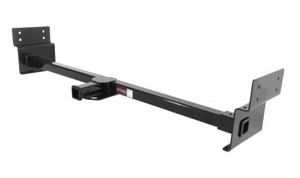 For example, a front-mounted hitch allows you to easily use a boat ramp by maintaining close control of your trailer. They are also excellent for holding cargo carriers and winches, though their gross trailer weight rating is typically restricted to 5,000 lbs. 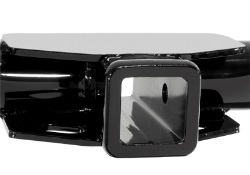 A front mount hitch may be of any class and can easily be installed on most full size pickup trucks, vans and SUVs. RV trailer hitches are specially designed to mount onto a recreational vehicle in order tow a bike rack, cargo carrier or even a small vehicle on a tow dolly. They range from 3,500 lbs to 5,000 lbs in gross trailer weight capacity and come with 2 IN receiver tube. Designed for light-duty towing, a bumper hitch bolts directly onto a vehicle’s bumper and provides a 2 IN ball mount receiver. Bumper hitches are excellent for lightweight loads such as bike racks and cargo carriers. A vehicle’s bumper rating is not increased by a bumper hitch. When selecting the right hitch for your vehicle it is imperative that you know your vehicle’s weight capacity rating. While the trailer hitch you select may have a GTW rating of 12,000 lbs, your car or truck may only be capable of towing 10,000 lbs. In this example, the tow vehicle is still limited to towing 10,000 lbs, even though the trailer hitch may be rated higher. The lowest weight rating, whether of your vehicle, trailer hitch or other hitch components, must always be the standard for weight capacity. To learn what your vehicle’s weight capacity rating is, check your owner’s manual. 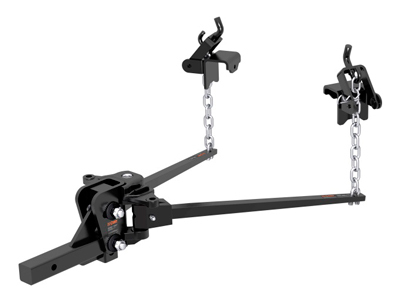 For certain applications, the use of a weight distribution hitch may be beneficial or even necessary for proper control of your vehicle and trailer while towing. A weight distribution hitch is a towing component that mounts into the receiver tube of your trailer hitch and lifts up on the back of the vehicle using two spring bars. This lifting function actually helps even out the weight of a heavy trailer such as an RV or flatbed and allows for a more level ride across the entire rig. While weight distribution hitches do not fit all classes of trailer hitches, they are compatible with class 3, 4 and 5 as well as xtra duty, commercial duty and RV hitches. In most cases, the use of a weight distribution hitch will actually increase the gross trailer weight capacity of a trailer hitch. This, however, does not automatically increase the towing capacity of the vehicle. Another factor to consider when selecting a trailer hitch is lifestyle. What are you planning to tow now and what will you be towing in the future? If you are an avid outdoorsman who loves cruising around on the jet skis, going camping and hauling a load of brush to the dump once in a while, then a class 1, 2 or 3 hitch will probably suit your needs. If you are the farming type or frequently pull a lot of heavy loads such as livestock trailers or RVs, then a heavier class of hitch is the obvious choice. It is a good idea to always buy a hitch that is over-qualified for your needs. That way, if you ever decide to purchase a larger trailer, your vehicle will already be equipped with the necessary hitch. Take a moment to look over the hitch selection guide below to help determine the hitch that will best serve your lifestyle. To further assist you in finding the correct trailer hitch for your vehicle, we have provided a simple tool to show you which hitches will fit your vehicle and which ones will not. Simply enter your vehicle make, model, year and other necessary information into the Quick Hitch Lookup feature at the top of the page, and your search results will indicate whether or not the product is designed to fit your specific vehicle. At CURT, we are ever striving to be the #1 source for trailer hitches. We take great pride in the hitches we produce and the satisfaction that our customers experience. With continuous innovation and excellence as our guiding principle, CURT is blazing a trail to new and exciting possibilities in the towing industry.